Novice Practice & Steersperson Clinic this weekend! Aloha, paddlers!! We are excited to be hosting a couple of events this Saturday, June 13th (in addition to regularly-scheduled Friday evening and Sunday morning practices). Read on for details! On Saturday, from 9 – 10:30am, we will be holding a Steersperson Clinic for club members who are currently steerspeople or are interested in developing their steering skills. We will review safety procedures and responsibilities of our steerspeople, and we will also have an opportunity to practice steering techniques and gain feedback as we develop our skills. Then from 10:30 am – noon, we will be holding a Novice Practice! This is open to new and current club members, as it will be an opportunity to focus on stroke technique and fundamentals of OC-6 paddling. We encourage individuals with any experience level (or lack thereof) to try the sport, and we are excited for our more “seasoned” members to participate as well, in order to share advice on what has worked well for them, as well as to ask questions and work on things that need more focused attention. There is a $10 suggested donation for individuals trying out COCC; this will be applied to your club dues should you decide to join COCC. Paddles and PFDs will be provided on shore. Please be sure to wear synthetic clothing and shoes. We walk the canoes into the lake, so you may be submerged up to waist-level. Old sneakers, water shoes, or rubber boots are ideal. Please no flip-flops or bare feet, as the rocks can be slippery. No cotton clothing is allowed (pants or tops). Even if the air is warm, remember that the lake is still quite chilly this summer, so we want to wear clothing that dries quickly and keeps our bodies warm. We have a locker to store personal items; anything you bring into the canoe may disappear if we huli (flip), so cell phones and keys should stay on shore, unless you are certain that they will float! RSVP for both events in the Practice Sign-up link on the right hand side of the page, and direct any questions or concerns to cayugaoutrigger@gmail.com. So excited to see everyone this weekend!! May 2 – Spring Club Meeting and Luau! We are excited to announce that on Saturday, May 2, 2015, we’ll be hosting our spring meeting from noon – 1pm, followed by a potluck May Day celebration from 1-3pm! Everything will be held at East Shore Marina. Excited to see new and returning faces as we kick off the season. Please bring a dish to pass. No RSVP needed, but feel free to contact us with any questions or ideas. Aloha, paddlers!! It looks like the weather should cooperate this coming Sunday, so we’d love to have you out to rig our canoes! We’ll begin at 10am at East Shore Marina, and if all goes well we should be finished in under 2 hours. Please email me at cayugaoutrigger@gmail.com if you are interested so that we are sure that we have enough hands. Looking forward to seeing everyone soon! anxiously awaiting “spring” in ithaca! but hopefully the water will thaw soon so that we can get out there and paddle. Looking forward to seeing everyone soon! Stay tuned for updates on a rigging party (if we are lucky enough to have a warm weekend on land sometime soon!) and our inaugural paddle of the year. As May already comes to a close, we have several practices and events to be excited about! We had our two novice practices where we had a total of 13 new paddlers come out! Some were seasoned SUP-ers and kayakers, whereas a handful had never been in a boat before! This year’s novices caught on remarkably quickly, and we’re hoping to see many of them return for the rest of the summer as the club continues to grow. 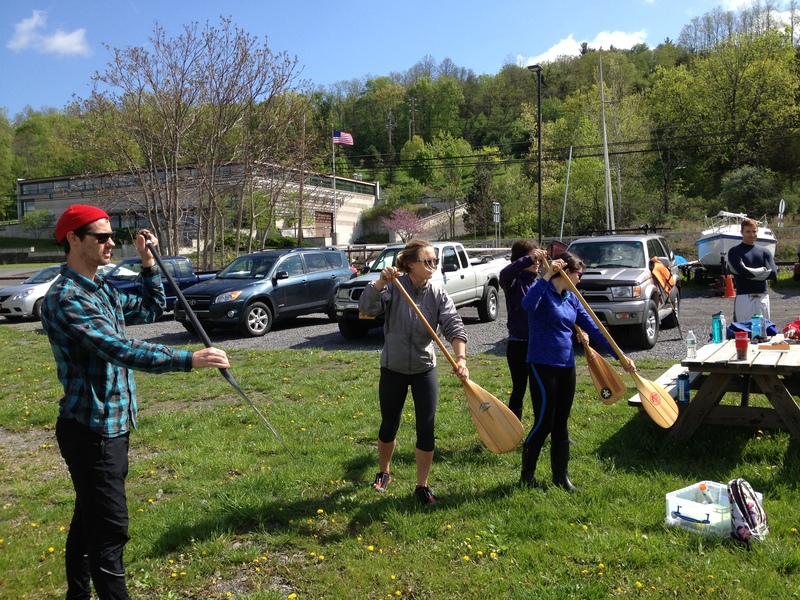 We also participated in the Plastic Tides event on May 18 (http://www.plastictides.org) on Cayuga Lake; a short “race” from East Shore Marina to Stewart Park designed to raise awareness and funding for the organizers’ trip to Bermuda where they will continue to combat pollution in our waterways. Our crew of 5 took off at the start of the race (trying to get out of the way of all of the SUP-ers battling the waves and trying not to crash into us!) and had a neck-and-neck race against one of our kayaking friends, Alan. It was a good test of our canoe Hoku’s stability (and Cynthia’s masterful steering!) as the waves and wind were picking up and nearly gave us an early huli drill for the season!! We ended up winning the 1.5 mile “sprint” and then paddled back to East Shore to warm up and head back to the BBQ. It was fun to see so many friends on SUP boards and first-time paddlers out on the lake. Must note that the water was very brown from all of the runoff we’ve had from major rainstorms and some minor flooding earlier that weekend. Thankfully our crew didn’t have to “swim” as much as those on their SUP boards! Fun day for the club, first “race” for one of new members Ryan, and a pretty cool cause to be supporting locally. As the water slowly warms up, we are planning novice practices on Saturday May 3 and May 17 at 10am. This will be an opportunity for new paddlers of any experience level (or lack thereof!). We will start with a brief workshop on land to review safety procedures and paddling technique, then spend some time in the canoes and plan our “workout” based on how everyone is feeling! We had a ton of fun with these last year, so we are very excited to be starting back up and see some new faces, or older faces just hoping to slow it down and work on technique. Our novice practices typically run about an hour to an hour and a half but may be modified depending how many participants we have and the experience level of our crew. Please email me directly at cayugaoutrigger@gmail.com to sign up or if you have any questions. We will only go out if we have enough to fill a boat. There is a suggested $10 donation to participate in novice practices. If you decide join COCC, this will be applied to your dues. Paddles and PFDs will be provided. - shoes that can get wet — we walk the boat in, so you will definitely get wet! The water is still very cold, so Neoprene booties are ideal, or wool socks with high rubber rain boots. - water-appropriate clothing. NO cotton. Please wear layers of synthetics if possible; fleece is great if it’s cold, headband if windy, otherwise a polyester top and shorts/pants are fine. Dress for the water, not the air! You will warm up while we are paddling, but it can be chilly when we stop, and painfully cold if we end up in the water. We’ll post any other relevant info as the novice practices approach! Just to note: we moved the rigging session to this Saturday, April 5. 10am, East Shore Marina. We are hoping to have everything completed in two hours and should have a pretty good turnout of club members. Looking forward to seeing everyone this Saturday, so we can actually be on the water very soon!! start of a new season! It was nice to see the club back together yesterday at our spring meeting. Always exciting to see those who haven’t been out in a while, and to hear everyone’s off-season reports of conditioning and/or recovering to get ready for a fun summer out on the lake. Congratulations to our new Board for the 2014 season! Also … we’ll be rigging the boats soon so that we can get back on the water and get back in shape for a productive season! This will be happening a week from today. If you want to give a hand, we will be meeting Sunday, March 30 at East Shore Marina from 10am – noon. The more hands, the easier it will be, and we’ll be that much closer to actually paddling again! If any potential new paddlers are considering joining COCC this season, this will be a great time to come out and meet some of our paddling crew. ’til soon! 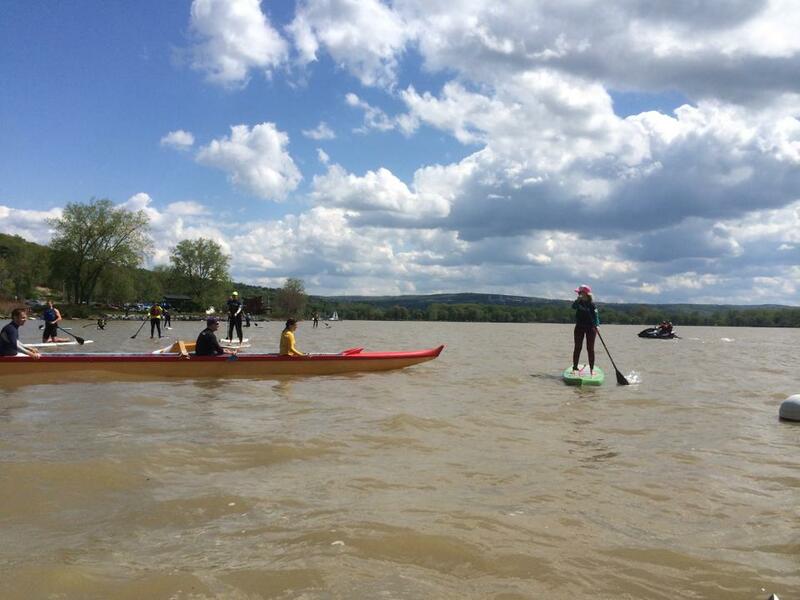 Greetings all … I think this is my last “blog” of the season, and probably my last paddle in Ithaca! For this year, anyway. The club is going to go full force through September and as far into October as the Ithaca weather (and ambitious paddling spirit) allows, but I’m leaving Ithaca for a bit … thankfully ending my season on a wonderful night of paddling in A’no:wara. My next time in an outrigger should be in Santa Barbara, which will be a totally different experience … yikes, actual ocean swells! I hope my training with Cayuga Outrigger serves me well! We have had very motivating and encouraging novice practices these past few weeks with students from Cornell engaged with the Concrete Canoe team (more details coming up in April when they actually get to host the regional races!!) and with some other students who spent time in Hawaii this past year, working on fixing canoes, but not actually paddling in them! Lots of fresh faces and great attitudes. We have really covered a lot of distance with them, thanks also to the fantastic coaching of Terry. Note that novice practices WILL CONTINUE for a few more weeks, most likely still on Monday nights, so continue to email me at blair.johnson@gmail.com if you are interested … I’ll keep coordinating even when I’m gone. Tonight’s club practice was simply a perfect crew also. Barbara, Virginia, and I came out, and we also had three fabulous repeat novices. I wish these guys weren’t graduating — they have so much energy and focus, I would love to keep training with them to see where they will go! They all seem to have fallen in love with the sport, so wherever they do end up, I sure hope that they find (or start) a club. We had wind and small but steady waves. Great communication, fantastic questions, consistency, strength … I loved it. I can’t thank them enough for such a beautiful and “peaceful” night … even while we worked our butts off to keep the boat rolling, it is such a wonderful experience to paddle together with a fun and unified crew. And take in some nice sunset views when we can steal a second to peek our heads out of the boat! Thanks, all, for a great season. Enjoy the last couple months before the lake freezes over … no better way to enjoy fall in Ithaca. 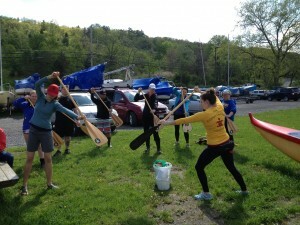 As school is back in session, we’re going to have some fall novice practices to attract some of our motivated undergrads or anyone in Ithaca who is still just learning about outrigger canoeing and wants to learn paddling techniques and squeeze in some outdoor training before winter sets in! This coming Monday, September 9, we will have a novice practice. Plan to arrive by 5:15pm. We will review paddling and safety procedures on land and be on the water by 5:30 (or earlier if we are ready!) for about an hour. Several students from Cornell’s Concrete Canoe Team will be present, and Terry and I will be steering (if we can take multiple boats out!). Please email me directly at blair.johnson@gmail.com if you are planning to attend or if you have any questions, so that we can plan our boats and get the most value out of everyone’s time. If you are interested in a novice practice this fall but cannot make it on Monday, please email me anyway and we’ll try to coordinate a convenient time in the coming weeks! Paddles and PFDs will be provided. Air and water are both cooling down, so dress accordingly — synthetic clothes (NO cotton or sweatshirts), layers, shoes that WILL get wet (something like tevas, water shoes, or even rubber rain boots). If it’s windy, a fleece headband or hat is great.